Implementing DTO involves dividing the device tree, building, partitioning, and running. After you have a working implementation, you must also maintain compatibility between the two DTs and determine a strategy for ensuring the security of each DT partition. Main DT. The SoC-only part and the default configurations, provided by SoC vendor. Overlay DT. The device-specific configurations, provided by ODM/OEM. After dividing the device trees, you must ensure compatibility between main DT and overlay DT so that merging main DT and overlay DT results in a complete DT for the device. For details on DTO format and rules, see DTO Syntax. For details on multiple device trees, see Multiple DTs. Compile main DT .dts into .dtb file. Flash .dtb file into a bootloader runtime-accessible partition (detailed below). Compile overlay DT .dts into .dtbo file. While this file format is the same as the .dtb file formatted as a flattened device tree, the different file extension distinguishes it from the main DT. Flash .dtbo file into a bootloader runtime-accessible partition (as detailed below). For details on compiling with DTC and verifying DTO results on the host, see Compiling & Verifying. Determine a bootloader runtime-accessible and trusted location in flash memory to put .dtb and .dtbo. Part of boot partition, appended to the kernel (image.gz). 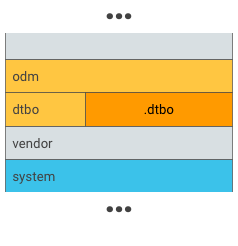 Separate DT blobs (.dtb) in dedicated partition (dtb). Figure 1. Put .dtbo into a unique partition, e.g. dtbo partition. Figure 2. Put .dtbo into odm partition (do this only if your bootloader has capability to load data from the filesystem of odm partition). Note: The size of the overlay DT partition depends on the device and the amount of changes needed on top of the main DT blob. Typically, 8 MB is more than enough and allows room to grow in the future if required. Figure 3. DTBO partition A/B, example 1. Figure 4. DTBO partition A/B, example 2. Figure 5. Typical runtime implementation for device tree overlay in bootloader. Load .dtbo from storage into memory. 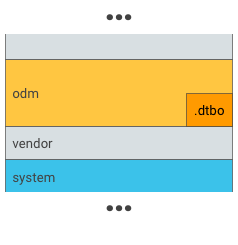 Overlay .dtb with .dtbo to be a merged DT. DT definition in main DT (e.g. nodes, properties, labels). Any definition change in main DT could trigger changes in overlay DT. For example, to correct a node name in main DT, define an "alias" label that maps to the original node name (to avoid the change of overlay DT). Overlay DT store location (e.g. partition name, store format). 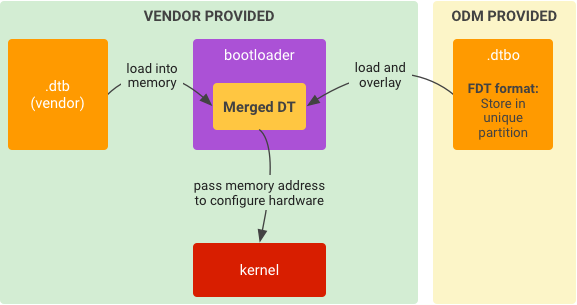 Bootloader must ensure the DTB/DTBO is secure, unmodified, and uncorrupted. You could use any solution to secure DTB/DTBO, for example, Boot image signature in VBoot 1.0 or AVB HASH footer (VBoot 2.0). If DTB/DTBO is in a unique partition, you can add that partition to the trust chain of AVB. The trust chain starts from a hardware-protected root of trust and goes to the bootloader, which verifies the integrity and authenticity of DTB/DTBO partition. If DTB/DTBO is in an existing partition (such as the odm partition), that partition should be in the trust chain of AVB. (DTBO partition could share a public key with odm partition). For details, refer to Verified Boot.